Asparagus soup is probably one of the best known soups. It comes in many different guises but the soup that many will associate with this vegetable is Cream of Asparagus Soup. This can be a really sophisticated starter for a dinner party and is discussed in more detail on its own page which you will find by clicking here. However there are many other ways to incorporate asapragus into a soup and we share some of these with you here. 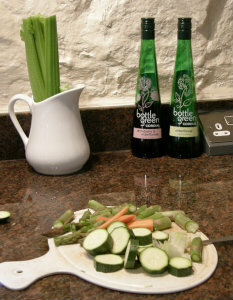 If you grow your own asparagus in season when you are eating asparagus on a regular basis you can keep the ends that you cut off and potentially waste. Gather a few days supply in the fridge then make some soup. Very economical. You could then freeze your soup for after the season has finished. Alternatively, if you are busy, freeze the offcuts and then defrost them to use later in the year to make one of these delicious soups. Simmer woody ends, onion, carrot, celery and chicken stock for about an hour. Strain or pick out solids with a slotted spoon. Saute the chopped vegetables in butter until leeks go soft and see through. Add the cooked vegetables to the stock and simmer for about 5 minutes. Puree soup in a blender, food processor or with an immersion blender. Season to taste. Add a final swirl of cream or creme fraiche and serve with melba toast or crutons. 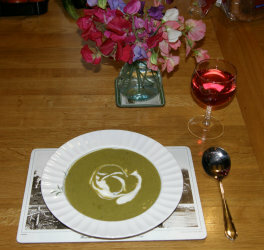 I make no apologies for the fact that this recipe for asparagus soup is pretty similar to the one above. The reason is that I stumbled upon this recipe by not having all the ingredients for the recipe above. Try it yourself and don't worry if you don't have all the ingredients you will just come up with another variation!!! Simmer woody ends, 1/2 the onion, celery and chicken stock for about 1/2 an hour. Chop the other half of the onion, the carrot and the asparagus. Saute the chopped vegetables in olive oil until lightly golden. You can serve this soup hot as well as cold, perhaps try it with crusty bread. soup recipes including soup stocks, tips, suggestions and related articles. Great soup recipes like lobster bisque and cream soups, plus many other soups.